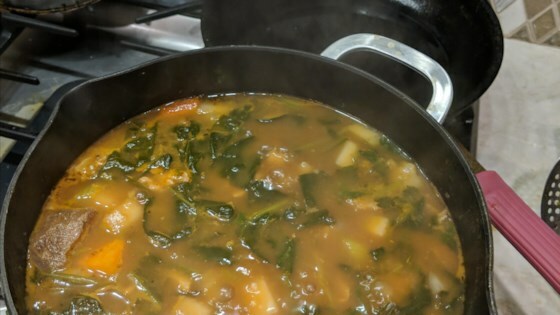 "This simple, nourishing stew of tripe and vegetables is found in innumerable variations throughout Latin America and around the Caribbean. On the islands of Aruba and Curaçao, it is known as sopi mondongo. Cooking Puerto Rican food is a bit similar to Island and Spain cuisine; it has a distinctive flavor combined with foreign influences using native seasonings and ingredients. Serve in deep bowls with white rice and avocados." Combine tripe and lemon juice in a large bowl. Let sit, about 10 minutes. Transfer tripe and lemon juice to a large pot. Cover with 2 inches of water. Bring to a boil; reduce heat to low and cook, stirring occasionally, until slightly softened, about 10 minutes. Drain and rinse tripe. Return tripe to the pot. Cover with 2 quarts beef broth, adding water as needed. Bring to a boil; reduce heat and cook until tender, about 2 hours. Stir remaining beef stock, cassava, potatoes, yams, pumpkin, sweet potatoes, tomato sauce, sofrito, and corn into the pot. Cook until tender, about 20 minutes more. Season with salt and pepper. Use pork tripe and stock instead of beef if desired. Mix 4 teaspoons instant bouillon granules into 4 cups warm water instead of the stock if preferred. Check my sofrito recipe on this site. Very good. The only thing I did differently was add one envelope of sazon with culantro and achiote.